This month’s ‘Faith & Fellowship Night’ was a great event held Thursday, January 18th with approximately forty-five parishioners and friends attending. After enjoying waffles, omelets, sausages and much more at the annual Breakfast-4-Dinner, all those in attendance began working together and assembling warm blankets for distribution by local law enforcement to those in need whom they encounter while on patrol in and around Laramie county. 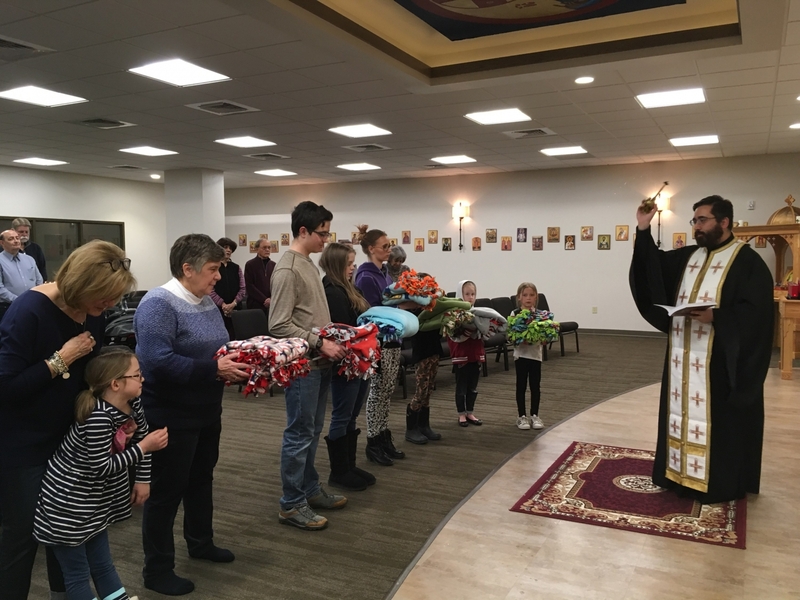 After the blankets were assembled, the volunteers brought the blankets into the sanctuary where Father Christopher Xanthos and parishioners gathered to bless them with holy water and prayers. It was a wonderful evening of fellowship and service. The monthly ‘Holy Apostles Faith & Fellowship Nights’ are open to the public and all are welcome to join! For more information about upcoming events and local community outreach oppurtunities please view the calendar or contact us.